Who here like XSEED? Trick question, I know. 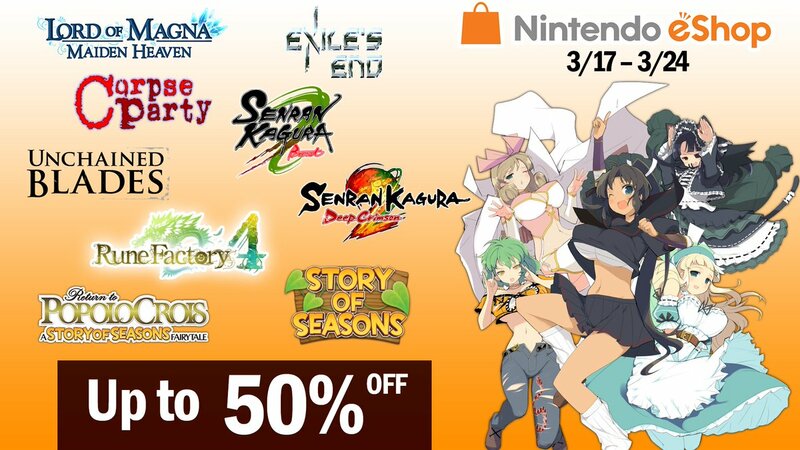 We are all fanboys of the fantastic XSEED here at oprainfall, so I was excited to find that they are offering a massive sale on their eShop offerings from today until March 24th of this year. The games included are the following, and range from adventure to RPG to horror, and everything in between – Corpse Party, Exile’s End, Lord of Magna: Maiden Heaven, Return to PopoloCrois, Rune Factory 4, Senran Kagura Burst, Senran Kagura Deep Crimson, Story of Seasons and the fantastic Unchained Blades. These games are up to 50% off, which is a pretty hefty discount. So if you like crazy Japanese goodness and live in the States, look no further than your handy dandy eShop!